FCE is one of the region’s leading high education and research institution in the field of civil engineering and is well established and recognized among scientific and professional community. Researchers at the FCE have found the technical solution for the application of recycled rubber in new product – RUCONBAR noise protection barriers. 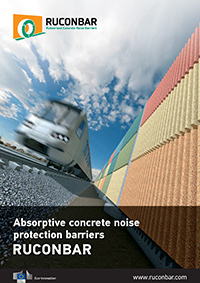 Researchers at the Department of Transportation (DoT) have a decade of experience in noise measurements and noise protection design, as well as supervision of noise barrier installation. Researchers at the Department of Materials (DoM) have significant results in new material systems and technologies in the field of civil engineering. BL has been successfully operating in Croatia and in the markets of Bosnia and Herzegovina, Montenegro, Slovenia and Serbia for the past 20 years. Nowadays, BL is the leading producer of pre-cast concrete elements which are mainly used in construction and maintenance of roads and railways. BL is well recognised in civil engineering community and associated with production of quality concrete products. GRP is the first company in Croatia for waste tyre recycling. Using modern technologies, through processing of waste tyres, GRP is able to produce granule of various sizes, whose later use is present in numerous industries. Using state-of-the-art technologies, waste tyres are transformed into rubber granule further used as secondary raw materials for the manufacture of new innovative products. IGH is leading design, consultant and research company in Croatia that deals with research and development in civil engineering. In addition to the Croatian market, IGH has strongly launched on the regional market: Bosnia and Herzegovina, Serbia, Kosovo, Montenegro, Albania, Bulgaria, Russia and Ukraine. Laboratory of Building Physics of IGH is the only laboratory of its kind in Croatia, and it is the only institution in Croatia in charge for issuing certificates for noise barriers. Zoological Garden of Zagreb is located in the wider centre of the city which is, as in most capitals, burdened with a large number of road and tramway vehicles. Due to its environmentally friendly profile, ZOO is an ideal location for implementation, promotion and presentation of ecological and innovative product RUCONBAR.